both my rings are beautifully custom designed by helene lucille (instagram account). as mentioned on our engagement story, dan was refereed to helene by his mom. dan met with her to find the perfect diamond and design of my ring. I had never told him the type of ring and diamond i wanted. He talked about my sense of style and went through my pinterest boards (ladies, it helps!). Dan picked out the diamond himself and decided on a simple thin band with diamonds on it. he made it so personal and truly shows how much he knows me. 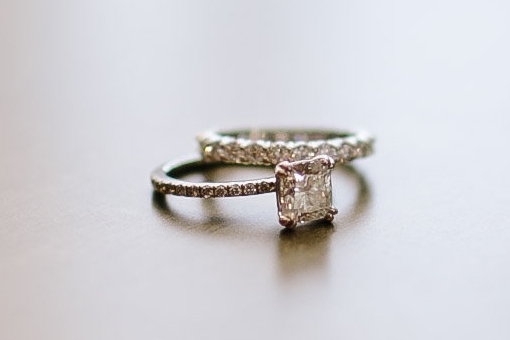 my cushion cut engagement ring is so perfect! after we got engaged, helene congratulated us herself and already invited me to meet her and talk about wedding bands! she welcomed me with open arms, literally, we hugged the first time we met! she showed me a couple of designs that would perfectly go with my engagement ring. all of the rings were so gorgeous it was hard to choose, but decided on an eternity band. she showed me a couple of them and i picked the one that was thicker than my engagement band so that it stood out a little more. she was so great and even worked around our price range! the band is so perfect and honestly how could you say no it! Helene has amazing tastes in diamonds and is so down to earth. I literally still come in for cleaning and we would talk about everything and anything for hours! she has amazing service and works around your budget. i mean, she helped dan pick out the perfect ring and diamond for me! seriously, if you have any questions about rings or any custom related jewelry, please check out helene lucille's website or instagram page and reach out to her! Make sure to bring up my name! 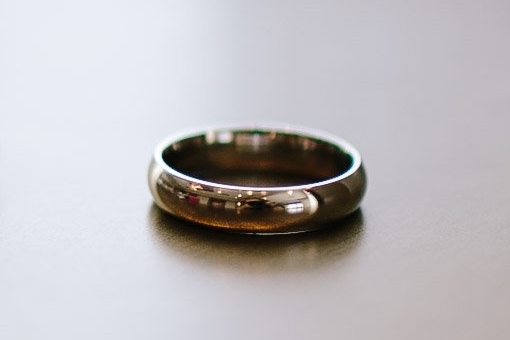 Dan's ring is from a different jeweler. I have a cousin who is also an amazing jeweler, diamonds by lou. she also makes custom jewlery and is based in New york. like helene, she also has amazing designs and also has great service. Dan didn't really have a specific style he liked, in fact he just wanted a plain band. diamonds by lou showed us a couple of options. But in the end, dan chose a plain and simple band. the band is 14K white gold, to match the metal of my engament ring and band. It is such a classic and perfect look for dan. I just love seeing this ring on his finger! if you are interested in this ring or anything custom related jewelry, check out diamonds by lou's instagram page! Make sure to mention my name!